"A person becomes a musician because he can't help himself, not because it's logical," says Laurence L. Teal, professor of saxophone, who is retiring this summer after 20 years of teaching on the University School of Music faculty. Prof. Teal's father gave his sons training in the performance of a musical instrument and in the art of barbering, so that each could work his way through college and take up "a nice, secure profession, such as dentistry." In those days, Teal says, "music was not considered much of a vocation, but was looked upon as a means of support while one studied something more respectable." 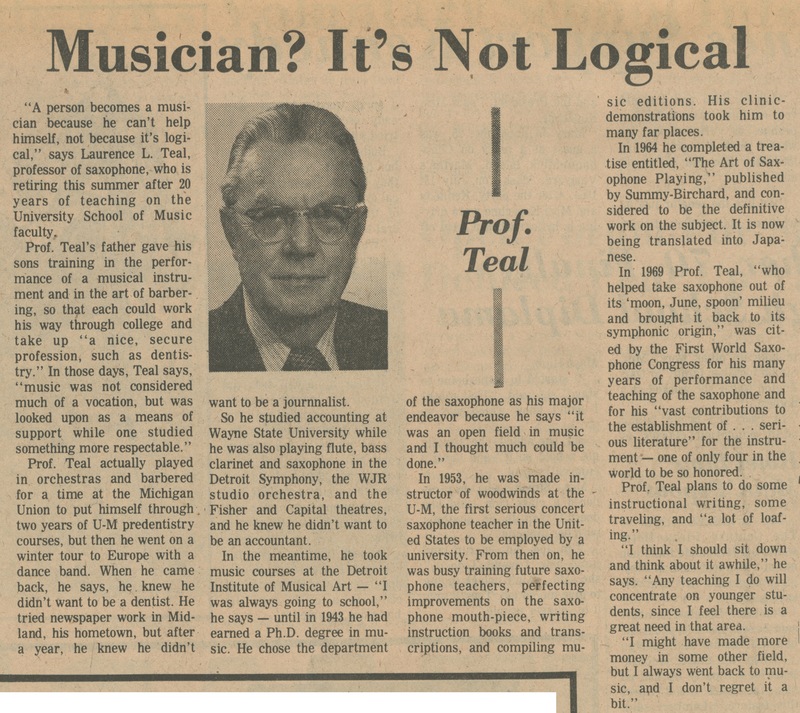 Prof. Teal actually played in orchestras and barbered for a time at the Michigan Union to put himself through two years of U-M predentistry courses, but then he went on a winter tour to Europe with a dance band. When he came back, he says, he knew he didn't want to be a dentist. He tried newspaper work in Midland, his hometown, but after a year, he knew he didn't want to be a journalist. So he studied accounting at Wayne State University while he was also playing flute, bass clarinet and saxophone in the Detroit Symphony, the WJR studio orchestra, and the Fisher and Capital theatres, and he knew he didn't want to be an accountant. In the meantime, he took music courses at the Detroit Institute of Musical Art - "I was always going to school," he says - until in 1943 he had earned a Ph.D. degree in music. He chose the department of the saxophone as his major endeavor because he says "it was an open field in music and I thought much could be done." In 1953, he was made instructor of woodwinds at the U-M, the first serious concert saxophone teacher in the United States to be employed by a university. From then on, he was busy training future saxophone teachers, perfecting improvements on the saxophone mouth-piece, writing instruction books and transcriptions, and compiling music editions. His clinic-demonstrations took him to many far places. In 1964 he completed a treatise entitled, "The Art of Saxophone Playing," published by Summy-Burchard, and considered to be the definitive work on the subject. It is now being translated into Japanese. In 1969 Prof. Teal, "who helped take saxophone out of its 'moon, June, spoon' milieu and brought it back to its symphonic origin," was cited by the First World Saxophone Congress for his many years of performance and teaching of the saxophone and for his "vast contributions to the establishment of...serious literature" for the instrument - one of only four in the world to be so honored. Prof. Teal plans to do some instructional writing, some traveling, and "a lot of loafing." "I think I should sit down and think about it awhile," he says. "Any teaching I do will concentrate on younger students, since I feel there is a great need in that area. "I might have made more money in some other field, but I always went back to music, and I don't regret it a bit."